When mounting debt becomes unmanageable, it's time to consider relief through bankruptcy. The Law Offices of David Luther Woodward, P.A. fights for your right to make a fresh start free from oppressive debt and irritating creditors. Bankruptcy is not your only option when facing large debts. If it is in your best interests to avoid bankruptcy, attorney David Luther Woodward can often negotiate with creditors to lower your debts and accept fair and reasonable monthly payments. Mr. Woodward applies intensive research and detailed analyses before advising you to file for bankruptcy. After reviewing your income, debts and other expenses, he counsels you on the true and total impact bankruptcy will have on your family, business, home and future credit. 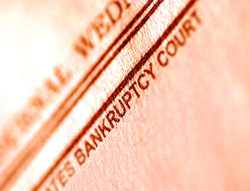 If bankruptcy is the right choice for you, he fully explains the process and the outcomes. His assertive approach to bankruptcy leaves no doubts. You should not have to endure creditors' aggressive collection tactics. Mr. Woodward puts an end to the harassing phone calls and irksome letters meant to pressure you into paying debts you cannot afford. Creditors must immediately stop collections efforts as soon as you or your business files for bankruptcy � including those distressing letters and phone calls. Mr. Woodward takes charge of your creditors and give you back your peace of mind. FINANCIAL DISTRESS: This area of practice includes not only bankruptcy�including Chapters 7, 11, and 13�but also includes the defense of businesses and consumers in law suits in state federal courts. * Chapter 7 bankruptcy grants persons and business entities relief from debt through the liquidation of assets. Mr. Woodward can negotiate asset exemptions for persons to limit the disruption to life. * If you own a corporation, partnership or sole proprietorship or if you are a person engaged in business, Chapter 11 bankruptcy permits your business to continue operating while you pay creditors under a court-ordered plan of reorganization. Chapter 11 is relief for business and persons engaged in business who need a "fresh start". This may include a complete restructuring of the business enterprise as well as reorganizing the finances so that solvency is regained and the pursuit returns to profitability. * Chapter 13 mimics in many ways Chapter 11, but it is specifically designed for the person or family that finds itself unable to pay its obligations as they fall due. It is a voluntary program of personal financial restructuring with an intent to maintaining the integrity of the household while providing repayment to creditors over a period of time. * Mr. Woodward represents creditors in cases in which no conflict arises and serves as counsel for creditors's committees in Chapter 11 cases. The Law Offices of David Luther Woodward, P.A. has been helping individuals and businesses facing overwhelming debts for 40 years. Call 850.456.4010 or contact the firm online to schedule your free bankruptcy consultation.